Gordolobo - Mullein flowers, grow in central and northern Mexico. Mullein is a biennial, which grows to a height of 1-8 feet. It has a tall, straight stem with large, oval, felt or flannel-like leaves and a long dense spike of yellow flowers near its top. The leaves become smaller and smaller as they near the top of the plant/ Gordolobo tea that is made from boiling the flowers and stalks in water, this being the form of ingesting the plant. Gordolobo is taking mainly to expel phlegm (mucus), to treat bronchial asthma and coughs, sore throat, sneezing, dysentery, diarrhea and diphtheria. Works well in sores and wounds on the skin as well as healing burns. 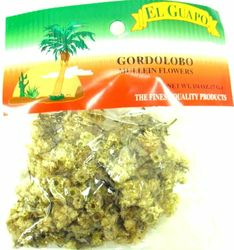 Gordolobo tea is also used for gastrointestinal complaints, because of its anti-inflammatory activity. The tea can be applied externally as a poultice to reduce hemorrhoids. It is very important to strain the tea before drinking it, as the plant material may irritate the throat. Avoid use of the tea if you are allergic to other herbs of the Daisy family, like Chamomile, Arnica or Ragweed. Consult your physician before using this product. Las flores de Gordolobo crecen en el centro y norte de Mexico. Gordolobo es una plata bienal, que crece a una altura de 1 a 8 pies. Tiene un tallo alto, recto, con hojas ovaladas como de franela y un pico largo denso de flores de color amarillo cerca de su parte superior. Las hojas se van haciendo pequenas y mas pequenas conforme van llegando a la aparte superior de la planta. El te de Gordolobo se hace hirviendo las flores y tallos en agua siento esta la forma mas popular de ingerir la planta. Se toma el Gordolobo mayormente para expulsar flemas (Mocos), tratar asma bronquial y tos, dolor de garganta, estornudoz, disenteria, laringitis, sinusitis, bronquitis, diarrea y difteria. Funciona bien en ulceras y heridas en la piel, asi como curacion para quemaduras. El te de Gordolobo tambien se usa para problemas gastrointestinales, por su actividad anti-inflamatoria. El te puede ser aplicado externamente como cataplasma para reducir hemorroides. Es muy importante colar el tea antes de tomar ya que el material de la planta puede irritar la garganta. Evite tomar el te si es alergico a otras hierbas de la misma familia botanica como manzanilla, arnica o ambrosia. Antes de usar consulte a su medico. This herb is pleasant tasting, soothing and fast acting. It felt like magic! I have been looking for this product and finally I found it. It really works, it�€™s the only thing hathelp me when I have bronchiole congestion. Take it all out! ProsEasy to use. Very effective. Last year I made tea from this herb because nothing else worked for me and my hay fever and allergeries. Coughing up mucus and sneezing 20 times a day. This tea was the only thing one that worked. I went to the local grocery store to buy some more and they ran out. I am suffering again with shortness of breath and stuffy nose, watery eyes and I just feel terrible. Please stock up. I recommend this product.